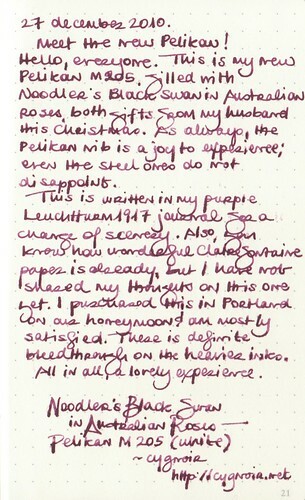 Not an ink and pen test: Noodler’s Black Swan in Australian Roses and Pelikan M 205. My husband surprised me this Christmas with the white Pelikan M 205 I had eyed in Flax, along with a stunning array of Noodler’s inks. I will save the others for their own posts, because this one belongs to Black Swan in Australian Roses. Click through for a larger version of the image. Materials used: Noodler’s Black Swan in Australian Roses ink, Leuchtturm 1917 dotted pocket notebook, Pelikan Souveran M 205 white fountain pen. I have more recommendations on fountain pens and ink, including inexpensive starter pens. ‹ PreviousThe danger of posting links without comment. Next ›My year, line by line.